The geodetic survey of the three great Giza Pyramids, published in 1883, by Sir William Flinders Petrie, has since been a perennial subject of analysis for geometric and numeric significance. To show that the three great pyramids are parts of one and the same plan, there have been attempts to generate their layout from pure ideas, a clean slate. Indeed, Giza abounds with inspiring relationships of varied accuracy, but, to safely pin ideas on the original designers, those have to prove their mettle by integrating into a system and being compellingly accurate. Why should we believe the builders had been capable of such accuracy to begin with? -- There is a number of well known examples showcasing the uncanny ability of Giza builders for accuracy, thus setting a standard for evaluating our own reconstructions as would-be copies of the original Egyptian plans. Often, the problem is that various elegant elements of design discovered at Giza by various researchers seem a foot or so out. Nevertheless, on a drawing board 35x35 inches, such ideas shall look absolutely accurate because their inaccuracy is diminished thousandfold. The Giza designers had been well aware of this convergence of multiple ideas. It adds greatly to the puzzle quality, but has misled many authors into wishful thinking. John Legon's reconstruction of the Giza plan, however, stands out among other works in the field, for it works remarkably well along the east-west axis. It is impressively accurate for three major lines, the east and west sides of the Second Pyramid, and the west side of the Third Pyramid. In contrast, the south side of the Second Pyramidc is 1.5 inches, or 40 millimeters off Petrie's plan, the north is 1 inch, or 25 millimeters off. So, why did the builders not achieve comparable accuracy in keeping with their plan along this N-S axis? We have seen that it was in their power. Perhaps, Legon's theory is too simple. Be it as it may, Legon is right when stating that axial spacing between the pyramids approximates square roots of the first five prime numbers, 1, 2, 3,5, 7, given in 250 x, and 1000 x multiples of cubits. In fact, his reconstruction comes fairly close to Petrie's plan, and had I been familiar with it earlier, I might have accepted it, albeit reluctantly. Legon's interpretation puts the ancient builders on a level everybody expects - they had a simple plan, and executed it really well, although somewhat unevenly. For this reason, I find it hard to grasp, why Legon's theory does not command more attention and approval from the academy. His only sin is making plain the Egyptian knowledge of square roots and Pi to several digits. That's it.. If Legon's theory smacks of heresy to the mainstream, what reception is in store for a theory like mine? It presents a sophisticated exact construction which duplicates Petrie's measurements (stated by Petrie to the tenth of an inch) with superb exactitude. The Golden Section, square roots, and Pi imbue it with a most appropriate spirit for sacred ground. I see our scepsis prone academy not treating this design kindly, because it is, frankly, too deeply thought out. After all, the Fourth Dynasty arrived almost on the heels of hunter-gatherers. How could its architects reach such sophistication so quickly? In short, if pressured, the academy might embrace Legon's theory, as the simpler (although incaccurate) explanation. Was there a GRAND PLAN for the three great Giza pyramids? A diehard skeptic will try to nip the idea in the bud and say that even if Giza's groundplan could be cleanly translated into a meaningful geometric design, it would mean nothing. Such prejudice seems to actually dominate the academic establishment. Anybody, who dares think otherwise is automatically discounted under various unflattering labels. Yet, the true solution, due to being both accurate and meaningful, will tower above others. Accordingly, the faults of my reconstruction are so miniscule and so insignificant that rather than being faults, they are manifestations of precision. The North-South distance between the pyramids is 35,713.2 inches. To show a fault of 1/100" in the plan on a computer screen, we need to assign at least a pixel to it. Then the total resolution has to be 3,571,320 by 3,571,310 pixels to show the fault. A computer screen 36" square, would sport about 100,000 pixels per inch in both directions. The fault of 1/100" would show on this screen as 1/100,000". Faults in my reconstruction range between 0.0014" to 0.035". Considering the size of Giza, it can safely be said that the reconstruction is microscopically precise. Consequently, it is in all likelihood the same as the original plan. By the same token, solutions, which draw over Google's satellite view of Giza need not apply. Although academic opinions suggest that measurements of the Great Pyramid by Cole supersede those by Petrie, I am confident in the belief that Petrie did a better job than Cole by the virtue of choosing the better method for the circumstances. I believe in what looks so perfect through the prism of my own reconstruction; My results are an order of magnitude nearer to Petrie's actual numbers than to his margins of error. It is, as if he were given the original plan to convert distances to the nearest tenth of an inch. In any case, Petrie's Giza work had to be a superbly accurate mensuration of superbly accurate objects. That would explain why there is massive agreement between my reconstruction and Petrie's plan, and none with Cole's. This reconstruction more or less accepts Petrie's cubit. John Legon makes a strong case that the North-South distance between the pyramids was meant by the builders to equal in cubits 1,000 times the square root of 3 (1.732...). As 1,732.05 cubits, it would belie extremely accurate planning by the Egyptians, as it extends to five decimals of the square root of 3. (1,732.05 squared = 2,999,997.2025, practically perfect three million, a reason to draw the square!) The reconstruction works best at this scale -- flawlessly. Some sensational value readings pop up, looking definitely non-random as a group. Exact numbers rather than geometric procedures are used in three instances in the reconstruction, which had the wind out of its sails for a while until I gave up using only dimensionless geometry and applied the cubit scale. In this manner, a strong case is made for the exact length of the cubit used in planning Giza's layout. It is also clear that the reconstruction would not work on any other scale, for then it could not convert to the above-mentioned exacting numbers. Petrie's measurements at Giza, and inside the Great Pyramid had produced slightly differing values for the cubit. He settled for an average of 20.62" (inch) per cubit. This reconstruction's cubit is 20.6190...", only 1/1000" off Petrie's value. It makes good sense for the designer to stop at the exact value of 1732.05 cubits (here is an example of a puzzle using decimals from La Marche, Stone-Age France ). The digit 5 for hundredths is followed by a zero, which means no thousandths (milli-cubits?) to deal with (1/1000 cubit is just over half-a-millimeter). The next digit is already too fine, so, this is a natural cut-off point. As a representation of the square root of 3, this value differs from the true by eight ten-millionths of a unit - 1.73205080.. The Giza plan evolves from a solid theoretical foundation - the Golden Section, showcasing the quickest, simplest construction of the regular 5-pointed star. The strange thing is that there is no mention of this technique anywhere on the internet, so it is definitely obscure. As for myself, I learned it from the Nazca-monkey! That is not to say that this construction is unknown in modern era (post Egyptian), but it is mildly surprizing that efficiency of construction is not a greater concern nowadays. Start with the above classic procedure. It begins with a horizontal line, and takes ten steps. Two of the steps involve help circles (to draw the axial cross), and these are not shown. The eighth step draws the key Golden-circle (yellow), which is centered in the bottom tip of the axial cross. On steps nine and ten, lines are drawn from the top of the axial cross as tangents to this circle (at P1, and P2). These lines create an exact angle of 36 degrees (like on a 5-pointed star). * The base of the golden triangle, given by the 36° angle intersecting the horizontal axis, is of the same length as one side of the Great Pyramid's prototype in this reconstruction..
* The circle from step 2 of the construction, is the actual instrument, which adjusts the prototype Great Pyramid to within ¼ millimeter of Petrie's plan. If this sounds baffling, check it out in action later. I thought that I should bring this to the reader's attention now to emphasize the strong bond between this pattern, and the reconstruction. On step eleven, we have a choice of three points (D, 1,2) from which to draw a circle. The one shown above centers in "D" and passes through "1" and "2". Then the other two (circled) points at which the circle crosses the 36 degree angle lines mark two more tips of a 5-pointed star. Lines from those tips drawn through "D" then complete the star. And that's it! (In trade terms, the simplicity of the construction is 13). The other choices use the same circle drawn from either "1" or "2". This diagram shows the circle centered in "1", which is marked as Q here, because it's an older diagram; I'll set it right, once I'll have the time. The position below is based on diag.1, but is rotated 90 degrees counterclockwise. It creates a slew of golden rectangles. * A line from 'A' through '1' and on to 'D' has the angle of a diagonal in a vertical golden rectangle, hence 'ABCD' is a golden rectangle. * A line from 'B' through '1' is equivalent to a golden diagonal, as well. * A line from 'D' perpendicular to 'AD' is a golden diagonal in 'CDEF'. * The combined form of the two golden rectangles (ABCD + CDEF), the 'Horizontal Column', will be our key to setting the pyramid's side to within a quarter millimeter of Petrie's value. * The Horizontal Column is next transformed into a square. One of the ways to do it is adding the golden circle's diameter to the underside of the column. * E' - will be the center of the initial Greatt PPyramid in our plan. A line through the points of intersection of the two golden circles in the diagram is yet another golden diagonal. The ratio of the Horizontal Column's height to the height of the rest of the square is 2(Φ-1). The points A-B-I-J-H mark four segments in a row, where each segment forms the Φ-ratio with the neighboring segment(s). In the diagram below, on both the blue 13-Step star, and its derivative - the red star, distances such as 'AB', and 'EF', are equal to 'CD', a side of the prototype Great Pyramid. At this scale, it is impossible to see any difference between the interim, and the true-size Great Pyramid. The diagram shows one way of drawing the pyramid's print in the sand. A line-segment through 'P' and 'C' is the same as one of the diagonals in a horizontal golden rectangle; it rises to 'C' to meet the left-rising diagonal of the initial Great Pyramid at the pyramid's northwest corner. The segment is key to further construction. The green square's extended side crosses a line of the red star at 'X'. This point is only 4 mms to the side of the Second Pyramid. .
Lines a, b, c, and d, all have the golden diagonal angle. In the diagram below, three of the four - 'a', 'b', and 'd' project the Great Pyramid onto the "13-step" construction. Line 'b' is tangential to the inscribed circle of the pyramid, and that also permits the reconstruction. This is the only generic way I know of to construct the initial Great Pyramid. Every other way has to do with the 13-Step star..
Line 'a': As a radius, it will usher this reconstruction from theoretical analysis to the applied stage. Let's call it the 'transmission-circle', when it is its turn. Line 'b' measures 1642.00222202 cubits, a typical measurement in cubits for this reconstruction. In the diagram below: One Q-circle intersects sides of the diamond (square), the other one intersects extended lines of those sides. Lines 'e'and 'f' originate from these intersections, and then intersect the initial pyramid's diagonals at its corners Either 'e', or 'f' suffices for the pyramid's construction. Altogether, there are five procedures, each projecting the same initial pyramid. Only one is generic, the others are firmly connected to the 13-Step construction. The design's nature is itself a strong hint at the designers' familiarity with the entire spectrum of possibilities therein. If the designers had known only the single generic way to project the initial pyramid, the incentive for selecting it at all would be much diminished. If the NE corner of the initial Great Pyramid (G1) is exact in this blueprint, the other corners are over 6 inches short of Petrie's locations. Yet, that distance shrinks to an invisible nothing on any drawing board ( 1/100 millimeter, if the board is 35" tall). Having the initial pyramid sets the stage for its adjustment to the exact specifications given by Petrie. The point marked 'X' in the above, or below diagrams sets a point on the south side of the initial Second Pyramid (G2). If the height of the big square is Giza's 907,115.28 millimeters, then 'X' is 4.2 millimeters above the south side of G2, as given by Petrie. A fact to note here is that without the '13-Step' star there can be no point 'X'. Without 'X', the best result in the location of the Third Pyramid's SW corner (to 0.51 mm) would not happen. On the same scale, the length of a side of the initial Great Pyramid, as well as a side of the pentagon within the 13-Step Star, is remarkably precise 439.50009259 cubits. It's a strong signal that the units used are correct. The distance between adjacent tips of the 13-Step star, or one side of the smaller star = 1150.626180 cubits. Here, we see five consecutive digits of Φ squared (2.6180). Coincidence? After the initial pyramid (proto-pyramid), the big square in diag.3 is extended to the pyramid's north-east corner to function as a containing square for the pyramids - the Pyramid Square (35,713.2" or 1,732.05 cubits per side). Much like the ubiquitous instruction guides for "dummies", the Giza designers provide easy to follow guidance in the form of pictorial clues. The Giza layout is uniquely expressive by being really close to an unprecedented number of elegant ideas, which might have dictated its design. One by one, these turn out to be inaccurate, mere illusions. Yet, illusions are part of reality, at least at Giza. Like in stereoscopic vision, illusions, the differing views of the same thing focus into the real thing. All one has to do is just get on the right track. The first exact reconstruction of one of the pyramids in the context of the Pyramid Square is the Great Pyramid. The process is remarkably short. Illusion #1 - Draw a circle from the southeastern (bottom right) corner of Giza's containing rectangle, such that it touches the Great Pyramid's circumcircle. This circle creates an illusion that it also touches the southeastern corner of G3 (Menkaure). Illusion #2 - The same circle appears to be of the same size as the "Transmission-circle" (e-circle) in the diagram below, whose radius is the golden diagonal from the pyramid's NW corner, marked as "a" in diag.5. So, we copy the Transmission-circle to the bottom right corner of the containing rectangle, as well. When concentric, the two circles merge into a single circle on this scale. Illusion #3 - From the center of the interim pyramid, draw the complementary circle, which touches the Transmission-circle, then copy it to the southwestern (bottom left) corner of the Pyramid Square. It gives the illusion of touching G3 from the other side (diag. above). This is certainly a startling effect, albeit up close it is not all that accurate. So, we have two pairs of alike circles , which look the same from high up above Giza. Without viewing things in the context of Pyramid Square, we would be deprived of this interesting observation. I wonder how many researchers may have observed the same illusion of the big circle from the southeastern corner of Giza's enclosing rectangle touching two pyramids, only to drop it as useless. Illusion #4 - Another special effect is shown below. Line-g drawn from the intersection (on the left) of the two Transmission circles to the SE corner of the initial Great Pyramid then duplicates the angle of the other golden diagonals to 0.0015º. This is a very fine value and the two lines look identical. The true golden diagonal drawn from that pyramid corner then comes to within 0.66'' of the same intersection. The midpoint of the gap between the Transmission circle and its complement circle, which sandwich G3, is 4.2 inches to the west of Petrie's vertical axis for the pyramid. Draw a vertical axis from there for our initial G3. * Center a circle at the point, where this vertical axis crosses the Horizontal Column. * Have it touch the far side of the little circle in the column's SW corner, whose diameter is the side of the pentagon inscribed into the original star, the '13-Step star. It is the same as the inscribed circle of the initial G1. The section of G3's vertical axis below the new circle is taken as equal to one side of G3. On the basis of this assumption, the pyramid is completed around the axis. Together, the NW-corner of the interim G1 and the SE corner of G3 in the above #1 version enable a simple operation which makes the reconstruction of the Great Pyramid identical to Petrie's plan. Robin Cook says that if we enclose the pyramids between 45º lines perpendicular to their N.W. by S.E. diagonals, as in the diagram below, the long axis of the resulting rectangle (the Rising Column) is almost exactly the same as one of the Second Pyramid's diagonals. The axis actually runs 13.82 inches east of the pyramid's diagonal; however, this relationship does look exact on computer screens or paper.But, I noted yet another special effect in this position, one three times more accurate: the width W-Z of the Rising Column is just 4.32 inches more than the width A-B of the Horizontal Column. Comparing, or substituting the reconstructed columns for each other could therefore be of interest, and is next on the agenda. The idea that the bottom side of the reconstructed Horizontal Column should also be the horizontal axis of Khafre's pyramid (G2), is a 10.12 inches miss. Marking the actual (Petrie's) thickness of the Rising Column straight down from the top side of the reconstructed Horizontal Column gets to 0.94 inch south of the second pyramid's horizontal axis. This special effect will be put to use later. "Go down the Middle of the Channel!" Place the Horizontal Column over the Rising Column (axis over axis). Then the situation in the Great Pyramid's NW corner looks like the following diagram. The long axis of the channel between the western sides of the two rising columns is identical to the western side of the rising column as given by Petrie. Alternately, a line drawn vertically down from the northwest corner of the wider Rising Column becomes one with the western side of the Great Pyramid in Petrie's version. On the line of the north side of the pyramid, both the west side of the wider Rising Column and the NW corner of the proto-pyramid G1, are equidistant to this corner (as given by Petrie). The difference in length between the reconstructed and the original versions of one side of G1 is too tiny to be noticed, at 0.0101.. inch (1/97), or 0.26 millimeter, or 0.0005 cubit. The pyramid centers are 0.007 inch, or 0.19 millimeter apart. In other words, the two versions of the Great Pyramid are identical. Our value: 439.827 (439.82732..) cubits, or 9,068.8 inches ( 9,068.79) per side. 439.82732 / Pi = 140.001.. The pyramid needs to be about 1 millimeter higher than its theoretical height of 280 cubits, to be perfect with respect to Pi, and this reconstruction.. The very same procedure works in the diametrically opposite corner of the Rising Column, albeit not as well, as it locates the SE corner of G3 to 0.5". It is far better than solutions by others, bar Legon, who is only twice as far out, missing by an inch. This is # 3 version of initial G3. (the SW corner remains a constant in all three versions). In the diagram, a and b are sides of the #1 initial version of G3, and 'c' is the reconstruction of the eastern side of G3. The line "c" is an obvious improvement over "b".. The diagram above is a close-up of a situation in the south-east corner of G3, the Menkaure pyramid. Lines 1 and 2 are sides of the pyramid, 'a' and 'b' are the two big concentric circles (the transmission circle, and the look-alike circle touching the Great Pyramid's circumcircle). The circles are spectacularly equidistant to the pyramid's corner! The centerpoint of the distance between the circle lines is 3.4 millimeters to the east of the pyramid's corner. The distance itself is 2.001 cubits, a highly precise value. Since the Great Pyramid's position is reconstructed with great precision later on in this article, the trick can be repeated with an even better result. It pins the southeast corner of Menkaure's pyramid 3.1 millimeters to the east.The distance between the aforementioned circle-lines then works out to 2.001011 cubits. And, measuring 1 exact cubit to the east from the circle 'b' will come even closer to Menkaure's corner, by 0.0005 cubit ( 0.25 millimeter ). The same procedure using the circle 'c' (below), which is tangential to the circumcircle of the initial Great Pyramid, produces the SE corner of the prototype G3 - version # 2. It is 3.68 inches to the west of the original, and half-way between a and c.
The symbolic language of coincidences around the transmission circle guides us along the trail. While I used to start the reconstruction from a golden rectangle without the precursory steps, I was left wondering: Why the transmission circle? Then I saw it (its radius) in the context of the '13-Step' construction (diagram below). Point '2' is a big point in the original 13-Step-star's construction. The radius 3-4 duplicates the golden circle's radius from the same construction. The segment 1-2-3-4 was used in the construction of the initial G1. It is the Transmission-circle's radius. The design involves classy geometry. With the Great Pyramid duplicated, it is now possible to do the following:. Above is a close-up of the situation in the SE corner of G3, Menkaure. Lines '1' and '2' belong to the pyramid as given by Petrie. Lines 'a' and 'b' are the transmission circle, and the tangential circle to the Great Pyramid's circumcircle. Going down the middle again, the axis of the channel between them is 0.13 inch, or 3.1 millimeters to the east of the pyramid corner as given by Petrie. This formidable result is as close as I got to Menkaure's SE corner by pure geometric construction, without resort to units. The radius of the cyan circle spanning the distance between lines 'a' and 'b', is 1.0005.., a rather exact cubit, to about 0.25 millimeter. It follows that measuring one exact cubit eastwards from the tangential circle, like in the diagram above, comes 0.25 millimeter closer, at 2.85 millimeters east of the SE corner of Menkaure. I should mention that Legon could follow this procedure as well, and get almost as good a result. at 3.15 millimeters from the said corner (I brought this to his attention; the two letters I had sent him are near the end of ""Notes"). The reconstruction above is by no means obvious, but once found, it could become a perfect false door, as it might distract one from finding the one ingenious solution for the same corner, which is a whole order of magnitude more accurate. It uses whole units as well and is meaningful with respect to Pi. The location of the reconstructed SW corner of G3, the third pyramid, yields some remarkable readings in cubits. 516.005, 516 cubits almost exactly. 113.0003 cubits , which is just 1/6 millimeter short of being perfect 113 cubits. This remarkable arrangement offers an easy way of reconstructing the SE corner of the Menkaure pyramid to 0.0003 cubit, and an absolute zero on the Giza scale. * Mark exactly 113 cubits from the SW corner of the Pyramid Square towards the SW corner of G3. * The remaining gap to this SW corner of G3 becomes the radius of a circle centered in the same corner. This circle then locates the SE corner, as given by Petrie, to within the above mentioned (1/6) millimeter, or 0.0003 cubit. In plain English, the two locations are perfectly identical. Numbers 113, and a 314 in association evoke a certain Pi approximation. The circumference of a circle with the diameter of 113 is a perfect 355 for all the practical purposes. 355/113 = 3.141592.. - The best approximation of Pi given as a ratio of two whole numbers. Accident? If so, it joins a plethora of coincidences pertaining to Pi, for which Giza, and especially the Great Pyramid are famous. Without it, there would be no exact reconstruction of the SE corner of G3, however. In turn, we need that one for the exact reconstruction of the Rising Column. The latter then takes part in the finding of G2's center. Earlier the reader saw a way to position the south side to within four millimeters of the original Second Pyramid. Given the center, the reconstruction would come out very nicely. Some usable data is mentioned in the note under diag. 19: 'marking the actual thickness of the Rising Column (W-Z), downwards from the top side of the Horizontal Column, gets to within 0.94 inch south of the Second Pyramid's horizontal axis'. We can duplicate the Rising Column, and in so doing, get to within 0.94 inch of G's horizontal axis. Yet, although this is a nice approximation for the horizontal axis, its true function is to take part in locating the vertical axis. Jim Alison had read the position in the diagram below, as saying that a circle centered in G3, whose radius is the horizontal distance between the centers of G1, and G3, closely approximates the Golden Cut in the given line (the green line marked Phi). Alison's circle actually misses the ideal cut by about ten inches. In this experiment, the green line segment Phi stretches between the center of the #2 interim version of G3 and an intersection of the circle inscribed into the interim Great Pyramid with the diagonal descending to the southeast. Next, divide this segment by Phi. The longer section of the segment is the radius of the correct Alison-circle. This circle intersects the golden diagonal "c" at "I" in the diagram. The point "I" simulates a point ion G2's diagonal. This relationship is an order of magnitude more accurate than the one Alison noted. The simulation falls 0.66 (0.6592..) inches northeast off the original. meet 0.66 (0.664..) inch southwest of the diagonal 'd' of the pyramid in Petrie's plan. This creates a point of insertion for the diagonal simulation 'c'. The channel axis between the diagonal simulations #1 (line 'e' in the diag), and #2 , runs 0.0001 cubit, 0.003 inch, or 0.07 mm southwest of the diagonal as given by Petrie.. It is truly identical to Petrie's diagonal. The diagonal simulation #2 will serve us again and help complete the solution for G2. There is also another way of replicating the same diagonal, which comes to within 0.006 inch of Petrie's version. It is really simple . See it in the notes at the end of the article. Earlier, the Horizontal Column, when substituted for the Rising Column, let us duplicate the Great Pyramid, as it is in Petrie's plan. But, since this is the ambitious Giza plan, the same trick works in reverse, and with even more spectacular results! The Rising Column in its final form, when suspended from the the top line of the Horizontal Column, falls 0.94 inch south of the second pyramid's horizontal axis (cyan in the diagram below). This line simulates the axis nicely, but its true purpose is different. It meets the Diagonal Simulation #2 0.0014 inch, 0.035 millimeter, or 0.00007 cubit east of Petrie's vertical axis. An unaided human eye cannot see 7/100000 cubit. Considering the size of our workspace, Giza, any hopes at the outset for this kind of results would be ridiculous. The vertical axis and the channeled diagonal together locate G2's center a pinpoint away from Petrie's plan, at 0.005 inch (1/200"), 0.13 millimeter, or 0.00025 cubit. We know the position of the southern side to 4 millimeters since early on, therefore G2, the Second Pyramid can be recreated with impressive accuracy even before the final adjustment. Having the initial Second Pyramid permits testing Legon's ideas in our settings. 1: The east-west (axial) distance between the west sides of the Second and Third Pyramids equals 250√2 cubits. 2: The east-west distance between the center of the Second Pyramid and the west side of the Third Pyramid equals 250√2 + 205.5. 3: Legon also implies that counting westwards from the east side of the Second Pyramid, 250√2 + 411 cubits locates the west side of the Third Pyramid. This formula works the best, as it locates the west side, or the SW corner, 0.0014 cubit (0.75 millimeter) east of Petrie's plan. The other corner of the south side is given with an even greater precision, hence the Third Pyramid stands recreated exactly as given by Petrie. This formula also works nicely for Legon's reconstruction - as it gets to 0.01 cubit (5.4 millimeters) east of Petrie's version. 4: Working with the Pyramid Square confers an opportunity to note another Legon-style formula for the reconstruction. Draw line d eastwards from the SW corner of the Pyramid-Square to the length of 250√2. Then subtract 39 cubits from it. The new segment ends 3.32 millimeters west of the Petrie's SW corner of G3. Moreover, segments b and d have a horizontal overlap of 0.00026 cubit, 0.005 inch, or 0.13 millimeter! How much more proof does one need to recognize that Legon really did discover something? This is also yet another example of the validity of the Pyramid Square's concept, which Legon never worked with, unfortunately. So, far we counted four accurate ways to deploy an exact formula containing 250√2 towards location of the SW corner of the Third Pyramid. As to its SE corner, earlier it was located by the means of the "magic number" 113, hence another exact number. Again, there is some consistency in that! So which solution should we use? The fact is that there are at once four accurate solutions for the west side of the Third Pyramid, or its SW corner. All four are accurate - since Petrie's points come with a ± radius, those points are in reality small circles, or dots. Multiple solutions are designed into the Giza puzzle, a show of sophistication. We shall never learn, which version was the one implemented on the ground. Draw a line westwards from the vertical axis of the reconstructed Great Pyramid, whose length is 250√3 , or 433.0127.. cubits). Make this the distance to the east side of the Second Pyramid. The fault from Petrie's version then is 0.00126 cubit, or 0.66 millimeter. Since the center of this pyramid is already located with utmost precision, the adjusted Second Pyramid is identical to Petrie's version. Petrie's layout of the great pyramids of Giza can be accurately recreated from scratch on a clean slate, beginning with the '13-Step' construction of the regular 5-pointed star from a line segment, with some involvement of the basic prime number square root values. The method has simplicity, total accuracy, elegance, and intellectual depth. With such attributes, it must be essentially identical to the actual Egyptian procedure of planning the Giza layout. For instance, working on any other scale would eliminate the phenomenon of whole and round numbers magic. The North to South distance between the pyramids must be taken as exactly 1732.05 cubits (1000√3 given to six digits).. It is noteworthy that the method does not work with the classical tools of geometry, at least not without a microscope. Given the scale of Giza, and the hairline differences between drawing objects, the plan had to be worked out mathematically. In that case, the knowledge of mathematics guarded by the temples was clearly on a level unattainable in a neolithic society less than two millenia removed from the hunter-gatherer stage. Asked beforehand, if a microscopically exacting solution to the Giza ground plan were possible, I would have naysayed it, for even if there were an overall plan based on exact ideas, and it were executed flawlessly, it would not be possible to measure the perfect result accurately enough. This would have given rise to discrepances. Yet, we (the readers and I) see such a solution here, thanks to Petrie. I still see it as somewhat inexplicable, for no matter how good Petrie had been, he himself admitted to a much greater uncertainty in his measurements. Of course, my theory about the Agency would explain many things, but a discussion of the Agency is not an object in this article. The breakthrough to solution of the Giza plan came from extending the enclosing rectangle (blue) of the three pyramids, which is rather ubiquitous in other studies, into a square. This simple step is very helpful, if not absolutely vital to understanding the position, but incredibly, no one before me had taken it! In this framework, some prior interesting, but seemingly dead-end, observations by others suddenly become meaningful. You can see that the Second Pyramid's vertical axis is surprizingly close to the vertical axis of the Pyramid Square. Next, I divided the square by the golden section (green lines). Obviously, the square base of the Second Pyramid mimics the small square in the center of the green cross. For a follow-up experiment, the Pyramid Square is given a basic Golden Section grid (diag. below). Lines of the grid create a Golden-cross within the square. Next, another Golden-cross is extrapolated from G2's (Khafre's) square. The two Golden-crosses are then superimposed over each other for comparison, as below. The similarity in size is striking. Below - another try at the same thing: translatting the exact CAD drawing into a Photoshop image does not always turn out the same. because the below image is a little bit smaller, it took out one row of pixels at the bottom of the big square. At this magnification, the result is an almost perfect illusion of identity . Could this illusion be a hint that the design of Giza has something to do with the Golden Section? In the diagram below, golden proportions added to the G2 in situ seem to find some correlation to the south side of G1. Here as well, we encounter facsimiles of golden rectangles. It deals with work by John A.R. Legon, Chris Tedder, Robin Cook, and Jim Alison himself on various notions of a ground plan of Giza's major pyramids. Note how none of the sites refer to this study, although there was ample time to make changes. Am I a Johnny-come-lately, am I trying to eat someone's porridge? * Perpendicular distances between the pyramid centers produce two golden rectangle facsimiles (ABCD, and DEFP). Chris Tedder sees two golden rectangles given by intersections of lines in cardinal directions emanating from the center of each pyramid. He proceeds to propose a possible plan, the Egyptians might have used. Unfortunately, these rectangles have poor accuracy, a fact that reflects negatively on the level of Egyptian skills, and thus the Egyptians were once again the scapegoats for the mistakes of modern scholars. The Giza pyramids dictate their containing rectangle. The rectangle dictates the square. The square constitutes the proper context for analysis. Adding Tedder's idea to the context of the Pyramid-square gives a spectacular result! Tedder's Secondary Rectangle #2 - Alison's circle intersects the extended diagonal of the second pyramid rising north due west at the I-point. The distances I-J and I - L form the golden ratio. The horizontal rectangle I-J-K-L is therefore an excellent facsimile of a golden rectangle. The diagram below shows how the combination of the old rectangle with the newer one creates a horizontal column, which is more accurate as such (a combination of two true golden rectangles) than either of its components. Pay good attention to what the top rectangle ABCD from the previous diagram does in the context of our Pyramid Square in the diagram below. It now extends from CD to OK. This new rectangle, ABOK is vastly superior to ABCD in representing an exact idea. While ABCD is a downright lousy imitation of a golden rectangle, it is impossible to tell ABOK from a combination of two exact golden rectangles ( ABCD, and CDOK), one vertical, one horizontal. At least on this scale, since the actual exact figure is 10 inches thicker than the original ABOK. In other words, the North-South distance between the two big pyramids provides a perfect visual experience of a sacred figure of two golden rectangles, in conjuction with the East-West distance from the Great Pyramid to the western side of the Pyramid Square. The notion that this figure was sacred to Egyptians, is supported by my analysis of a door from Hesire's tomb (Hesire was a colleague of Imhotep). http://www.vejprty.com/hesirefn.jpg The figure of Hesire engraved upon the door is contained in the same rectangular figure ABOK. Meanwhile, we can also see in the diagram, how really inaccurate the original ABCD was as a golden rectangle, because the original CD line is 3.8 cubits to the west of the exact line. Moreover, this diagram lets us see, how the golden diagonal emanating from O is impossible to tell from a line made from the same point to be tangential to the Great Pyramid's inscribed circle. All this is important, because armed with these facts, it is already possible to geometrically reconstruct with visual perfection the Great Pyramid's square base in relation to the Pyramid Square. The pyramid's side will then be shorter than it is in reality by on this scale invisible seven inches. So, if we suppose that this was how the builders had evolved the Giza plan, their skills suddenly look vastly superior to the level set for them by Tedder. It is unusual that as far as I know, no one had worked with the Pyramid Square concept before. After all, extrapolating a square from a rectangle is so simple! It was the first thing I had done once I'd had Petrie's ground plan in a CAD drawing (Computer Aided Design). To me this step was elementary, because all my previous case studies in ancient science-art had involved an all important square. Draw two golden rectangles, a vertical one on the left, and a horizontal one on the right, diagonals radiating from their corners,. The rectangles form a single column - the Horizontal Column. C divides A-K so that if C-K equals Φ - 1, then A-C equals Φ, and A-B equals 1. 1) The center of the Great Pyramid is at the top right corner of the Horizontal Column. 2) The left side of the Horizontal Column is the western side of the Pyramid Square. 3) The diagonal 'a' is tangential to the inscribed circle of the Great Pyramid (diag.6). This circle is then enclosed in a square, i.e., the pyramid sides. 4) The lines through the north and east pyramid-sides are corresponding sides of the Pyramid Square. With three sides of the square known, so is the fourth - the bottom of Square. The south side of the third pyramid lies on the square's bottom (diag.7). Naturally, the golden rectangles above could be preceded by a number of different starting positions. But, only the '13-Step' stars produce a close location for one side of G2. Legon's theory - Competitor or Contributor? Since my own theory draws some important benefits from Legon's work, he has my gratitude and admiration. As for my critique of his work, a brief peer review of sorts, first of all, our respective approaches differ greatly. While this reconstruction is done completely from scratch, Legon starts out by copying the Great Pyramid (G1) directly from Petrie's plan. Then he derives the rest. At first, he uses basic geometry, but from there it is mostly a march of numbers. My reconstruction is essentially visual, it is a progression of pictures, each showing special effects, which embolden further inspection. It is a show packed with action, exactly as intended by the original designers! It has long accepted Legon's premise that the north-to-south span of the pyramids expresses the square root of 3. Acceptance of this idea is a basic requirement. However, Legon assumes that the span was intended to be 1732 cubits exactly. But, it is crucial to the reconstruction that this distance be taken as more accurate by two decimal points of 1000√3, i.e., 1732.05 cubits. Not using this scale would eliminate the best result for the location of the Third Pyramid's south-east corner. The next domino to fall would be the microscopically accurate reconstruction of the Second Pyramid's vertical axis. Other dominoes would follow. Only the Great Pyramid would remain unaffected. Reconstructing Legon's reconstruction - Legon does not give the actual procedure. Rather he states several possibilities, which are all supposed to lead to more or less the same accurate result. Consequently, I select those that yield the very best result on his behalf. Because there are two possible scales of reconstruction (N-S = 1732 , and 1732.05 cubits), I felt obliged to carry out a reconstruction for each. Also, Legon says that he measures from the center of the Great Pyramid's theoretical version, the one with an even number of cubits per side (440), but actually works from the center of the version given by Petrie. Start by drawing the averaged out square base of the Great Pyramid, as specified by Petrie. Next, extend the east side to the south to equal 1732 cubits (Ö3), or 35,713.1 inches. This will be the axial north-south distance from the north side of the Great Pyramid to the south side of the Third Pyramid. Mark 1101 cubits from the north southwards on the extended east side of G1 (the Great Pyramid). This will be the axial distance to the south side of the Second Pyramid. Mark 433 cubits ( 250Ö3 = 433.0127..) from the center of the Great Pyramid westwards. This is the axial distance to the east side of the Second Pyramid. Since the positions of two sides, south and east are already known, and because Legon postulates exactly 411 cubits as the intended length per side, the square base of the Second Pyramid can be now be drawn in full. Next, if we make the axial distance between the western sides of the Second and Third Pyramids 250√2 given to two decimals (353.55 cubits), it is just 0.008 cubit short of the western side of G3. This is a very accurate result. Since the positions of two sides, south and west are already known, and because Legon postulates exactly 201.5 cubits, as the intended length per side, the square base of the Third Pyramid can be now be drawn. This scale goes to two more digits in the fractional part of Ö3 than the one Legon uses. The same procedures used previously on 'his' scale, achieve nice great accuracy here as well, but with one important difference - instead of rounded out values for the square roots, they work with the actual exact root values! But, it must be noted that overall, Legon's method gets better results on the less accurate scale of 1732. Importantly, what works really well for Legon, works even better for this reconstruction. It gets Legon's reconstruction to 5.4 millimeters of the western side of the Second Pyramid, but it gets us to just 0.51 millimeter. However, Legon's result for the eastern side of the Second Pyramid is closer by a fifth of a millimeter than this reconstruction, but that is because Legon does not reconstruct the Great Pyramid in this position like me, copying it instead. Legon's division along the east-west axis is accurate to half a millimeter for the east-side of G2, and half a centimeter for the west-side of G3. For the division along the north-south axis, Legon uses two procedures, which he deems both accurate. Each procedure works better on one scale and worse on the other, but neither works nearly as well as the procedures along the east-west axis. This unfurls cautionary flags..
How close is 14/10000 inch on the Giza scale? Center and axes remain, as above. The tables given above show that aside from two accurate, and one semi-accurate readings, Legon's reconstruction does not reflect Petrie's data with consistent accuracy. The layout of Giza is very rich in geometric illusions. It makes decryption tricky. In a spiritual sense, false paths obscuring Giza's recreation (I blundered down a few of those) may well symbolize the soul's perilous journey through the labyrinth of life to fulfilment. At the risk of sounding mysterious, reality then is the axis of symmetry between illusions.. The first criterium is how close the reconstruction gets to Petrie's position. The reader saw that the faithfulness of the reconstruction to Petrie's plan is in a class of its own, and nothing else comes close. Another aspect of the reconstruction, which puts it into a class of its own is the undeniable extreme proximity of many of the resulting measurements to whole or half cubits. 439.82732 side of the reconstructed G1, which yields a very good value for Pi ( 3.1416..) with half-height of the pyramid (140 cubits) 439.8273 / 140 = 3.1416.. In my internet search, I came across some 15-step operations, but then in February of 2010, I got a letter from Mike Ivsin about his original construction of the regular pentagon. Applying Ivsin's ingenious original idea to pentagram construction, I found that it is a 14-step process. In the below diagram, the first five steps are in black color, the following five are blue, and the rest are red. Two of the circles appear as Vesica Pisces in order to clean-up the image. Magic happens, when Ivsin goes on to add just one circle ('c') to the basic construction, whose radius equals the length 'a' of the star's arm (diagram below). Now, extend line 'b' so it meets 'c', and draw the line 'd'. What we have here is the cross-section of the Great Pyramid! The angle between lines 'e' and 'd' is 51.82729237 degrees, which rounds out to 51º50'. A quote from Petrie: On the whole, we probably cannot do better than take 51º 52' ± 2' as the nearest approximation to the mean angle of the Pyramid..
* Hence, 51º50' complies to the lower ± limit set by Petrie. It is true that the Giza layout, as well as the Great Pyramid's cross-section seem derived from Golden Section designs, namely, the construction of the regular pentagram needing the least number of steps, 13, and possibly, the only other such construction needing less than 15 steps. In any case, the nature of each construction is consistent with the other, and thus augments its credibility. Giza broadens the Nazca - La Marche connection (between the Nazca-monkey, and one Stone-Age engraving from the rock shelter of La Marche, near Lussac-les-Châteaux, France, with 1,500 masterfully engraved stone tablets, now kept in museum vaults, and largely unknown to the public). Why do these three ancient works from different ages and continents encode the same construction? 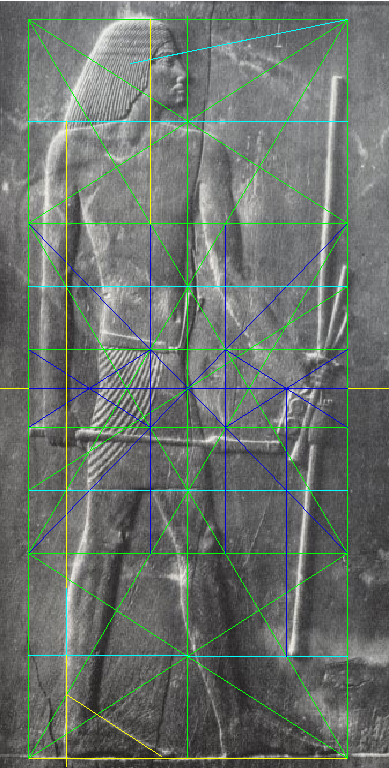 Is there some connection here to the apparent imagery of the so called Abydos Helicopter, which also encodes a rigorous construction of the Golden Ratio? Petrie's value of 9,068.8 inches, or 230.348 meters, or 439.82782340 cubits of the actual average side by the standard of this study, is about 2.5 mm off the desired perfect value for Pi. An error of less than 3mm was allowed for by Petrie. Hence he could be off by that much, and the pyramid may have been built perfect. If we let the facts prevail, the conclusion must be that the average pyramid side was designed with the true value of Pi in mind. "In terms of the Giza royal cubit of 0.52375 metres, the actual mean side of 230.364 metres corresponds to 439.8 cubits, with an average variation in the sides of only 6 cm or 0.1 cubit. Petrie suggested that an adjustment may have been effected in order that the perimeter of the base should express the so-called 'pi-proportion' in relation to the height of 280 cubits, with greater accuracy than the value for pi of 22/7. In this case, the theoretically exact mean side-length would be 439.822... cubits. It seems that the builders achieved this result while retaining the round number of 440 cubits in the south side." Naturally, a measurement dictates both its exact, and rounded out values. The need for a side of 440 rounded out cubits arises from the perspective of Phi. The apothem divided by half the side, or 356/220 equals Phi to the first three decimals (1.618 181818...) Mike Ivsin's construction produces perfect Phi, with a slope, which is in Petrie's ± range. It seems that the builders had achieved this result, too. Legon abstracts a cohesive system from the Giza position, one dealing with square roots. Although some of these readings are somewhat approximate, Legon suggests logical reasons, why there were adjustments. In my opinion, Legon correctly identifies an additional layer of abstraction in the position. Compared to the "13 Steps" reconstruction, it is considerably less accurate, yet it makes perfect sense in a rounded-out way. The more meaning, the more reason for selection of this plan. By the way, Legon seems somewhat unhappy over the east-west distance spanned by G1 and G3, which is 3 cubits too long to express the square root of 2 as 1414. Did he discount the fact that the north-south distance between the centers of the same pyramids is three cubits shorter than the desired distance and thus produces a correct average? digits of the Square root of 2 = 1414213..
east of G1 to east of G3 = 1417.4888..
north to south distance between centers of G1 and G3 = 1411.414161.., the first three digits are correct; the next five are a peculiarity, for 1.414161.. gives the same root to five correct digits when rounded to 1.4142. 1417.4888 + 1411.414161 = 2828.902961 / 2 = 1414. These two distances between G1 and G3 also add up to 2828.. the first four digits of the square root of 8, which equals 2 x the square root of 2. A long-time researcher, Robin Cook adopts the right approach in observing all strong relations as possible coincidences first, and then asking, which of the mutually exclusive relations might be the intended ones. Cook is right, because without the illuminating background of the 'Pyramid Square', such ideas are a bit like Plato's shadows dancing on a cave wall. In such situations it is easy for a theorist to become convinced that his recreations mirror the Egyptian planners, before the builders strayed from the plan somewhat, just as expected, or before the plan got changed for reasons unknown. It makes sense that the designers had started out with regular squares. Adjustments were then made to create a new layer of meaning. > Giza pyramids and temples. Whenever you reconcile the obligatory appreciation for the eternal beauty of the geometry involved, and the fact that this is Giza, the issue of intent may become clearer. . Such a design certainly places the layout into the highest category of sophistication. > the base of Menkaure’s pyramid is 335 x 343 feet. It most certainly does, considering that his figures differ wildly from not only Petrie, but also Cole, who after all did come close to Petrie in measuring the Great Pyramid. It pits him alone against two widely acknowledged professionals. plus, Lehner was caught cheating in a drama of his "This Old Man Pyramid", if I have the title right. A mechanical shovel was used to move some blocks, but no mention of the fact was made in the flick. I found that typical of the PyramiPhobia, which so torments some academicians they will sell their soul to the devil. Cole took series of measurements of the available sections of the excavated pavement. The various hypothetical lines were then averaged out, and extended until they met near the corners. Considering how close Cole comes to Petrie, he did a great job! Yes, the acclaimed and anomalously accurate casing! The quality of work, said Petrie, equaled modern opticians, but on the scale of acres. Determination of lines from the plane of the casing blocks, and their projection down to the pavement to produce an averaged out line in the pavement should naturally be superior to relying on measurements from a single line, as Cole had done. The descending gallery shows similar accuracy in that it deviates from its axis over the course of 350 feet by a quarter inch (6 millimeters) side to side, and only one tenth inch (2.5 millimeters) up and down. In using the anomalously accurate plane of the casing blocks to obtain a hypothetical line along the pavement, Petrie seems to have achieved even greater accuracy. This was another logical decision by Petrie, which gave his method further advantage over Cole's. Clearly, the sockets were the target the builders were aiming the sides at. Petrie was a consummate professional. In my eyes, his drive to provide the most accurate data on Giza surpassed Cole's. After all, Cole could only be bothered to survey one pyramid. Thus he forfeited further experience with measuring at Giza, which might have given him a little more insight. The fact that Petrie's measurements set the position up for an incredibly accurate regeneration from a clean slate using the noble Section, can by no means be discounted. With this reconstruction of the Giza-layout everything clicks into place. A click in the reconstruction - a booming cannon shot across the bow of Egyptology! Another way of reconstructiong the Second Pyramids NW to SE axis. The big red circle is actually double, with centers in both the #2 and #3 interim versions of G3: From the pyramid-center of each version, draw a circle through the SW corner of the (golden) Horizontal Column. Each seems tangential to one axis of G2. In fact, both come close. G3 #3 version - the circle is 0.8163 inch past the axis. The axis line of this channel is 0.006 inch, 0.0003 cubit, or 0.16 millimeter to the southwest of the original G2 axis given by Petrie. A detail of my analysis also works for your theory. It gives a nice and easy way of duplicating Petrie's location of the SE corner of G3, within the framework of the pyramids'containing rectangle: It works with the NS distance set to 1,732, or 1,732.05 cubits. a) Circumscribe the Great Pyramid. b) From the SE corner of the containing rectangle draw a big circle touching the circumscribed circle of the Great Pyramid. c) Go east exactly 1 cubit from the point, where the big circle crosses the SE boundary of the containing rectangle. The result is a touch over two millimeters to the east of the SE corner of G3, as given by Petrie. Since I learned this fact by geometric means, and since yet another method was a distraction by yielding an even better result, it took a while to dawn upon me that this fact also helps your theory. My apologies for the delay in letting you know. p.s. Since 1,732.05 signals a square root, where is the square? John, I think that your theory warrants asking that question. To me, the square is the extended containing rectangle of the three pyramids. Its area is 2,999,997.. square cubits (or 2,999,824 @ 1.732 cubit). Draw the square, and it will light up the next clue, bringing the solution a step closer. Thank you for drawing my attention to your essay on the Giza plan. sorry, I made a mistake, for a saving of 0.0005 cubit represents only 0.25 millimeter, and not 1 millimeter. So, the result brings you to 3.15 millimeters east of the mark set by Petrie. Still, it is better than the discrepancy of 33.9 millimeters, if one follows the procedure in your report.